Join us for a weekend when single Catholic women come together to learn more about religious life from the women who live it! 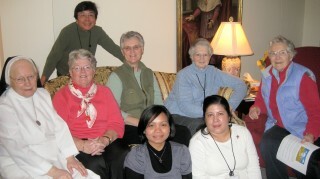 You will meet and talk with Sisters of Bon Secours in a relaxed environment. You will be surprised at how much you will get to know about religious life and how much you will enjoy being with the sisters. Meet others exploring too. There is time for prayer, liturgy, group sharing, and relaxation. We begin Friday at 6:00 pm and end Sunday at 1:00 pm after Sunday Mass and lunch. View events calendar for dates.